Stackable rings have come back into style in a huge way — and it’s easy to see why! The trend allows for so much versatility, and is a great way to dress up your Fall wardrobe. Whether you’re into a more understated look or you’re a bold fashionista, you’re going to love bringing stacked rings back into your repertoire. When your outfits consist of comfy turtleneck sweaters and cozy circle scarves, accessorizing can be a challenge. Necklaces run the risk of being drowned out by layers, and bracelets end up being covered by long-sleeved jackets. That’s why stackable rings are the perfect way to add some bling to your outfit this Fall. Mix it up: Don’t be afraid to mix your metals. 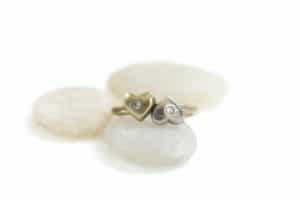 If you’re unsure of the look, wear the same ring in different finishes. Play with Placement: One of the cutest ways to wear this look is to pair thin and dainty midi rings with regular rings. Use up your entire finger! 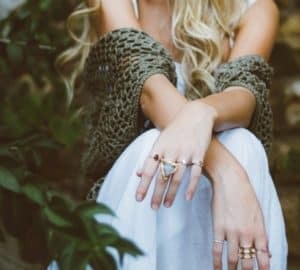 Pair Different Styles: A really cool way to punch up your look is to pair dainty, simple rings with thick, cuff-like rings or bold statement rings. Absolutely anyone can add stacked rings to their wardrobe. Whether you love minimalism, the boho chic look, or prefer a more feminine style, this trend will fit seamlessly into your wardrobe. For the minimalists out there, pair your monochromatic sweaters and booties with simple bands of the same metal and style in varying sizes — mini, midi, and large — onto one finger for a cool and sophisticated look. Chunky knits and patterned scarves have met their match with this trend: pair funky rings with different metals for an easy, breezy style that stands out. Spread multiple rings out over all your fingers for an upgraded aesthetic. If your style consists of bold patterns and bright colors, combine flashy statement rings with simple stacks across your fingers for an irresistibly flashy look. Pair a simple sweater, leggings, and riding boot outfit with a simple, thin band ring on each finger. Step this up by playing with midi and mini ring sizes. To step up your ring game even more, pair this look with a matching mani! Simple French tips or baby pink nails go perfectly with simple stacks, or go glittery and patterned with statement rings. There’s really no limit to the ways you can style this trend, which is why it’s coming back in a big way. Not only does it super easy to adopt, it’s one of those trends that works with any style. 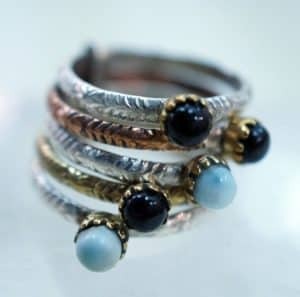 Stay on top of the fashion trends and add stackable rings to your wardrobe! Mallory Walker is a fashion and jewelry enthusiast based in Illinois. When she’s not reading up on the latest styles, she enjoys hiking with her German shepherd, Duke. Stackable accessories is a huge demand in youngsters and very attractive for fashionistas. Thank you for sharing this article with us. Great article!